In her lifetime Grace had had considerable practice at constraining her emotions, and would never have believed it would be hard to control them now. But as the porcelain pulverized on the floor it was as if it were human tissue disintegrating. The figurines were the offspring of the meeting between the township and her. They were the proof that in spite of everything, her suffering had created something of value. Grace could no longer cope. For the first time since her childhood, she wept. The beautiful fugitive's name was Grace. 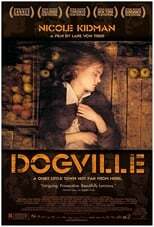 She hadn't chosen Dogville from a map or sought out the township for a visit, yet Tom felt right away that she belonged.